Monthly Spriting Competition! Apr-May '15 ~ RESULTS! Cute Young Lady Assistant Maggey! I have received the all-clear from Commander Bolt Storm , and now CR will have it's own monthly spriting competition! Simply put, Each month, a different category/genre will be set by the previous competition's winner, and you need to make a sprite that fits their criteria! 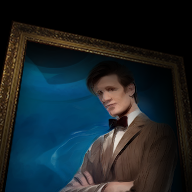 This month it's your task to expand the Bluecorp personnel. You can either dress an existing character in a Bluecorp CEO or Assistant's uniform (Like I did with Edgey! ), or create your own custom employee, updated Bluecorp uniforms or even a new CEO to replace the currently jailed Redd White! There's a lot of freedom to this! - Create your own original character who works for Bluecorp, adorned in a Bluecorp uniform. The competition will run from April 1st and ends May 1st. Last edited by SuperAj3 on Fri May 22, 2015 12:15 pm, edited 48 times in total. Monthly? So I won't have to wait for another game to come out? Unfortunately I have no prizes to give But the winner gets to pick the next month's topic! Kinda like in AAO Ropfa. I'm looking forward to this. It'll be nice to see what topics a new group of minds comes up with. sick! sounds like a blast! The rules go perfectly for one of my OCs I made. Re: Monthly Spriting Competition! Apr-May '15 ~ Bluecorp! You have Until May 1st to enter. This is a cool theme. I actually came up with some Bluecorp OCs sometime last year XD There was something I wanted to test out anyway, so I'll try make some time for this. I'm happy to know people are taking interest! Can't wait to see what people enter! Anyway, for voting, you might want to consider using strawpoll? If thats allowed. My very first thought was "Put Redd White in Godot's vest" but that was one of the samples... I'll have to think harder, but I definitely want in on this. I have one character in mind. I'll try and slap something together, but it probably won't be a full set and just the base image. This is my first entry here and I'm not entirely sure if I need to give any information beyond just the picture, so I'm gonna go ahead and cover my bases. 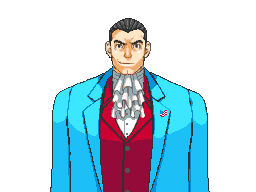 Hair from Manfred, face from Gumshoe (slightly edited), body made from Edgeworth's, colours taken from young gumshoe and Edgeworth for their respective parts, Lisa Basil for the jacket, and Damon Gant's tie for the vest. 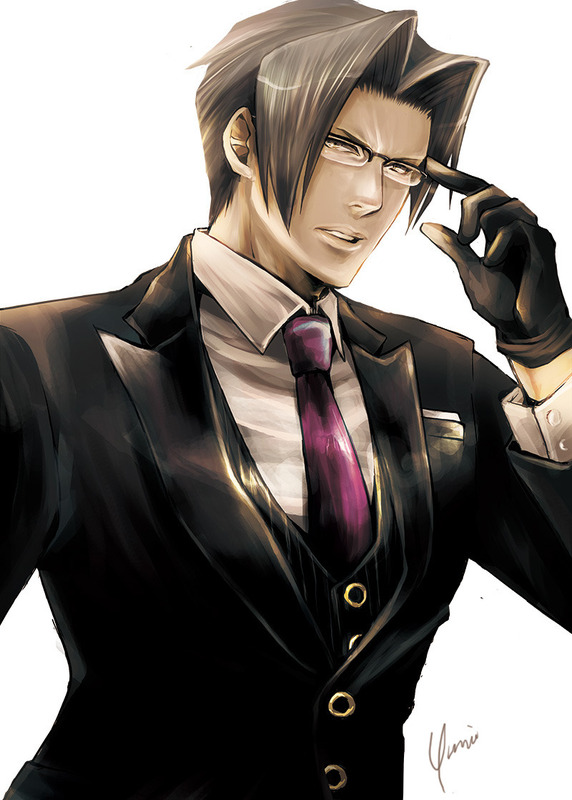 I didn't give much thought to the character himself other than he's probably some sort of executive. Low-level employees don't wear bright colours and 'Murica pins, after all. 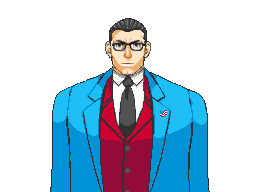 And special thanks to TheDoctor who convinced me to edit this sprite in the first place. Our first entry! You've made history, my friend! Looking good! Love the little US flag pin! 'Murica! Don't worry about saying what parts you've edited. (I've used/seen all the sprites so much I can tell ) But thanks for covering the bases. This is my entry, a new CEO of Bluecorp. Last edited by SilverGS on Fri May 01, 2015 9:15 am, edited 1 time in total. Thanks Silver! And Don't worry! You sprited that Ackbey one, right? So it's still your work. 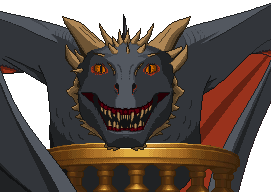 I just said don't use other's fan sprites. It's a good clarification to have though. On AAO, the rules are to create an entirely new sprite for the competition. 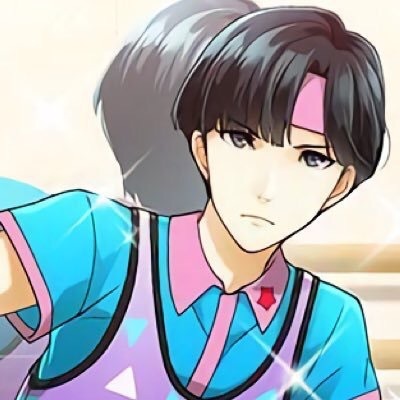 It can be based off something you've sprited before, but it can't be an already existing sprite, if that makes any sense. That makes sense. I'll add that to the rules. Just a reminder there's a little over 2 weeks left until voting! Currently we have 2 entries. This could be neck-and-neck! Yeah, kind of makes it difficult to find a winner if the only voters are contestants themselves (unless people can actually bring themselves to vote for someone else's work when they've clearly been bested, but that almost never happens). Awesomesauce! I love that little debrief you wrote too! Name Lilia Porpora, occupation: CEO of Bluecorp. Extras:I decided to make her look like she came from the Phoenix original trilogy, that's why she has only about 16 colors, and she's supposed to be tall, that's why she's going to look tall comparing her with another character form the original trilogy. Awesome! Do you mind if I just take one frame as a preview? I'll link to the whole sheet otherwise! 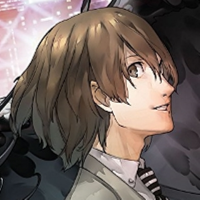 Why does she remind me of Ms. Kashiwagi from Persona 4? Do you suppose it's the pose? Hahaha, she reminds me a little of Mia. That looks really cool Mija! Just a reminder there's 1 week left before voting! Thanks to everyone that's entered so far! So, I tried going back to using a canon sprite as a base and I think I've actually gotten to the point where my scratch sprites are better quality. Any future entries I make in this are definitely gonna be 100% from scratch. Thanks! That's Entry No. 5! Don't worry if you use another sprite as a base! It looks really good! I can't tell what it was based off! EDIT: I forgot to mention! If you want to edit your entry, you can revise (minor things ONLY like fixing lines, anatomy in certain areas, certain facial features etc. No re-doing your whole sprite from scratch!) it as many times before the cut off as you like! Just edit your existing entry post. I'll go through each post and copy the images after entries close to make sure your most updated one is shown for the voting. Last edited by SuperAj3 on Sun Apr 26, 2015 4:23 am, edited 2 times in total. EDIT: I forgot to mention! If you want to edit your entry, you can revise and re-post it as many times before the cut off as you like! You can re-post, or edit your existing entry post. I'll go through each post and copy the images after entries close to make sure your most updated one is shown for the voting. 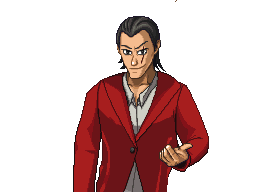 I think I've already accepted defeat, but I kept toying with my sprite trying to turn it into more of an original character and less Gumshoe in a cravat. I can barely draw so it's still all frankensteined together, but I'm gonna go ahead and resubmit this. Not super polished but I like it more than my first. Haha, have confidence in your original entry though! By 'edit' I was referring to minor things like cleaning up some lines or fixing anatomy. This is fine though. I updated the rules to specify "Minor edits only", no full remakes of something you already submitted. I don't want people to make 5 different iterations because they fear they'll lose with their current one. This is all for fun, so what you enter is what you enter! If people think allowing edits is wrong, I'll remove that rule for future comps. Ah, yeah, that, that makes sense. Sorry. Take the original one for the contest then, I just felt that maybe I'd jumped the gun and posted the original too soon. Thank you for the vote of confidence, but I just have way too much respect for anyone who can draw their own stuff. I'm pretty new to spriting (and forums) and with so many great artists on here I'd hate to come off as anything but humble. If you want, you can enter both as alternate poses for the same character? 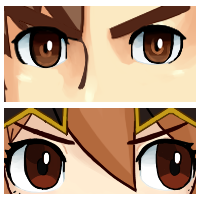 It may be daunting seeing others who've been spriting for longer, but still try your hardest! This is a good way to learn from other's works and so it's really good you're giving this a try! Final warning call for entries! In about 7 hours May 2nd will hit (for me) and Voting opens! EDIT: I'll wait another 24 hours just in case. If no one posts here tomorrow, Voting will begin!